Frequency Converter, aka AC power supply / AC power source, is electric supply conversion device. It converts the alternating current in the electric supply through AC→DC→AC, and outputs pure sine wave. The frequency converter changes a fixed-frequency (50 Hz, 60 Hz), fixed-voltage (110V, 120V, 220V, 230V, 240V, 380V, 400V, 440V, 480V etc.) sine wave power to a variable-frequency (50Hz, 60Hz or 400Hz adjustable), variable-voltage (1-phase 0-300v adjustable, 3-phase 0-520v adjustable) output used for international appliances compatible, make power source with no difference among countries. ATO.com offers both single phase and three phase solid state (static) frequency converters, power capacity from 500 VA to 600 kVA. Built in step-up/step-down transformer convert US power supply 120V 60Hz to UK 230V/240V 50Hz, step down 1-phase 220V 50Hz to 110V 60Hz. Three phase input frequency converters are designed to operate from a variety of global 3 phase sources, including 208/220/240VAC, 380/400/415VAC and 460/480VAC, also can change 60 Hz 50 Hz frequency to 400 Hertz, widely used in household appliance, industrial, lab test, aircraft, military etc. 500 VA solid state frequency converter, AC power supply, convert single phase 110V, 120V 60Hz to 220V, 230V, 240V 50Hz (vice versa), stable and pure sine wave output for household equipment, testing, etc. 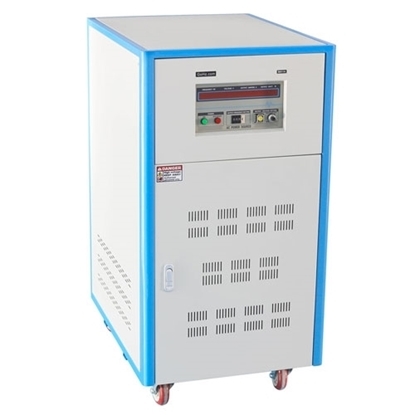 Reasonable price 1 kVA frequency converter, changing 1 phase 220V 230V 240V 50 Hz to 110 Volt 60 Hz, 120V 60Hz to 240V 50Hz, convert fixed frequency to the required frequency and voltage with pure sine wave output, portable AC power source. 2 kVA static frequency converter, 1 phase 110V/120 60Hz power to 220V/230V/240V 50Hz boost in one step (vice versa), voltage and Hertz converter with pure sine wave output for US and Europe home appliances. 30 kVA pure sine wave AC power frequency converter, single phase 110V/120V/220V/230V/240V input, single phase 0V to 300V output, convert 50Hz power to 60Hz for household appliances, 400Hz for aircraft.